MANILA, Philippines – Sen. Ferdinand “Bongbong” Marcos Jr., only son and namesake of the late dictator, on Tuesday shrugged off the enactment of the Human Rights Reparation and Recognition Act for the victims of human-rights violations and other abuses during the martial law years. In an interview after the enactment of the law last Monday, Marcos said their family and the estate of his late father, former President Marcos, have nothing to do with the compensation being sought under or mandated by the new law, because the government had seized the family’s assets a long time ago and decided to distribute part of it to the claimants. “As I keep explaining, this is actually an issue between the human rights claimants and the government and it is no longer—of course it involves the Marcos family before and my father’s estate—but that is no longer the case. If the government chooses to support it and it seems that they have, then it would be implemented,” he explained. Marcos said neither he nor any member of his family–former First Lady now Ilocos Norte Rep. Imelda Marcos or his eldest sister, Ilocos Norte Gov. Imee Marcos-Manotoc—has a legal personality on these actions since the issue is now between the claimants and the government. “We do not send lawyers, we do not appear as a party so, again it’s between the claimants and the Philippine government now,” he said. Last Monday, Congress ratified the Bicameral Conference Committee report on the Human Rights Victims Reparation and Recognition Act, a measure that will pave the way for the payment of compensation to all victims of human rights violations during the Marcos dictatorship, capping a 20-year legal battle. “Again, it has nothing to do with us at this point anymore because the judgment has been made against us and our position has been very clear. The government has confiscated the assets, so it’s up to the government to now dispose of them as they see fit,” Marcos said. “Ako tinanggal ko na ang sarili ko sa usapang yan dahil nga [I have removed myself from that equation because] as I said, first of all we are the main party and . . . I cannot be seen ever to be objective about the subject,” he added. 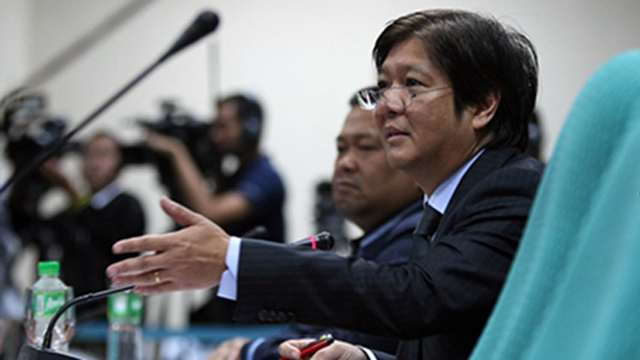 On the tricky matter of selecting those to whom the government will give compensation, Marcos said that under the class suit case, the members of the class should be identified and each claim assessed—a procedure that is being done by the government now as it reviews previous lists of claimants.